***Edit: Congratulations to Vanessa Dewson, an Ottawa area photographer, who won our Twitter giveaway! Yes! We are giving away a beautiful set of letterpress calling cards. We recently added to our website the option of ordering 300 pre-designed calling cards for only $150. Printed on soft white, 265 gsm Bamboo paper, all you have to do is choose the design you like and enter your information on the order form. To kick off our new line of calling cards, we are offering a free set (300 cards). What do you have to do? It’s easy, provided you have a Twitter account. Super easy! We will be drawing at random from the list of retweets and revealing the winner both on Twitter and here on Friday afternoon. Printed in one colour only. 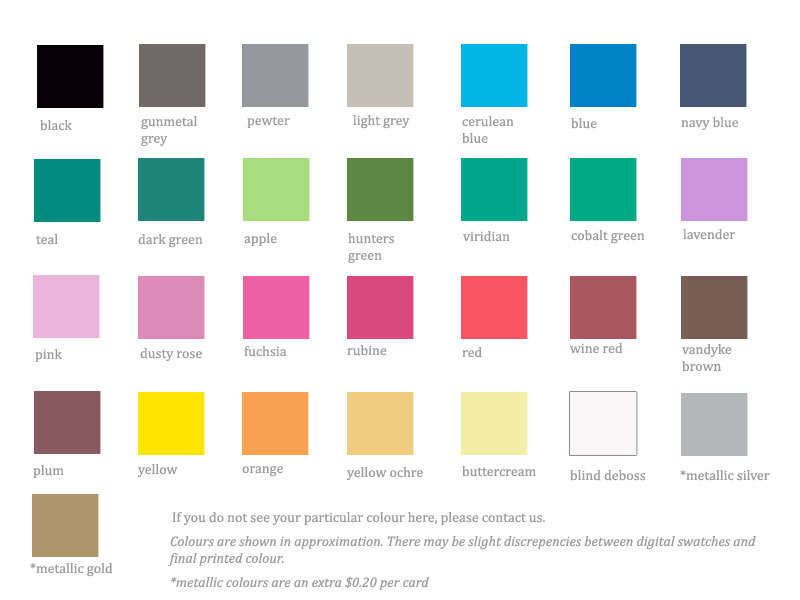 Choose a colour from our palette. (Giveaway does not include any other colours, including blind printing & metallics). Choose one of our six pre-designed calling cards (show above). We will ship the order for free within North America.